It's easy to believe Terry Andrews was a popular, energetic cheerleader in high school. 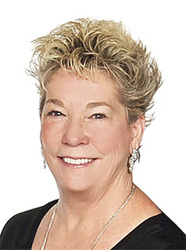 To this day, she bubbles with enthusiasm and generously applauds the growth and success of her fellow MAC members, the IBOAI, the Field, the Corporation and her family. Her energy and support are invaluable to MAC and the Board. While Terry's husband Bob, IBOAI Chair, selflessly lends his leadership and vision secure the future of the Amway opportunity, Terry is doing the same as MAC Chair. She believes in people, encourages them to have faith and applauds their victories. Terry's willingness to dive into the "next great adventure" is not only contagious, it has motivated the MAC to collaborate closely (and consistently) on new products, campaigns and programs, specifically designed for IBO success in North America. 2015 marks Terry's fourth term serving on the MAC. Terry loves spending time with Bob and their two sons' families, especially their two beautiful grandchildren. The Andrews' are also transforming lives by contributing time, talent and finances to their local church and the Free Wheelchair Mission®.